If you’ve been a Winhost customer for more than a year, you may not know that we added the option to enter a second account security question. You may be thinking, “I created one security question when I opened the account, why should I add a second?” The reason we recommend adding a second question/answer is because we run into a lot of instances where a user will forget their account password and also the answer to the primary security question. Having the second question/answer available could save you a lot of trouble if you ever find yourself locked out of your account. Go to the Account & Billing section of Control Panel and click the “Security Question” icon. 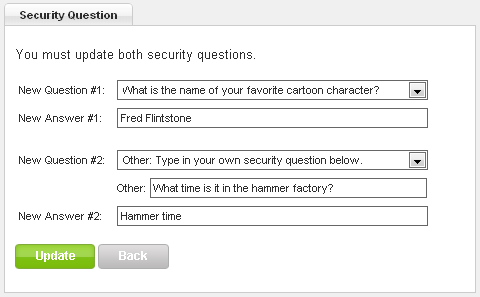 One of the cool features of the additional security question is the ability to add your own question, rather than choosing from one of the standard selections. From the “New Question #2” dropdown, choose “Other: Type in your own security question below.” That will open up a text entry box for your own question. When you’re finished just hit the “Update” button and that’s it. Security can be inconvenient, but we really recommend that you change your account password and security questions at least once a year. We’re on your side, but we have very stringent security policies, so if someone gets into your account, it can be difficult for you to regain control. Rotating your passwords and security questions regularly can prevent unfortunate problems down the road.